The video quality is certainly subpar, but this is our first real-world look at the Tesla Semi accelerating swiftly from a stop. At the big Tesla Semi reveal event, we saw the 500 mile, all-electric rigs slowly roll onto the stage. Later that night, there was a video that captured the Tesla Semi driving in the background. 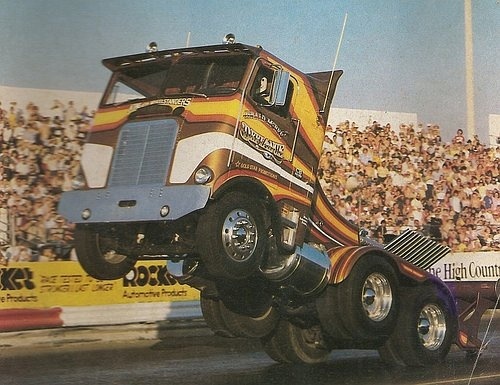 But until now, we’ve yet to see footage of the semi accelerating from a standstill. Live footage, that is. Our wait is now over. It’s impossible to gauge just how quickly the Tesla Semi is accelerating off the line, but we sure as hell have not seen a semi of any type move as swiftly as this. At 14 seconds, the door bangs shut and the semi is off. Within about 6 seconds, it’s already hundreds of feet away. Watch for yourself and you’ll see that a big rig has never moved like this before. 19 Comments on "First Tesla Semi Acceleration Video From Reveal Night Surfaces"
I only saw ‘500 Mile’ Range Trucks presented! Where are those 5000 Mile Range Trucks??? One charge from Mexico to St. Johns? Nice! ?? No that is just the sound of the motors as they spin faster you will notice the frequency rise. I thought it was too but in the video linked below (https://youtu.be/tBiUkiic_cI) towards the end you can hear it’s actually tire hop and traction control. Good spotting Shaun, will add that into the story! Thanks! Trucks aren’t about speed but I can see how acceleration numbers that allow to keep up with traffic a bit better could avoid a lot of annoyance. What does that refer to? Your feet tapping on the pavement? Of course I’m jesting but does anyone use tape or film anymore? No, but that doesn’t stop people from using the word “tape” as both a noun and a verb referring to a digital recording. Nor have we stopped describing the process of pressing buttons on a phone as “dialing”, despite the fact that the dial phone is long obsolete. I’m a strong Tesla fan, but this is just silly. Nobody is going to buy a Tesla Semi truck just to be able to accelerate the tractor fast when it’s not pulling a trailer. I want to see a Telsa truck pulling a load over the Grapevine to see how fast it really is. That drop in sound is NOT the doppler effect! This thing is shifting gears! Or more accurately, shifting gear-motor assemblies. Like the roadster, I bet they have two different motors. Low speed and high speed. I’m betting they’re running one gear ratio on the front set of wheels and a different ratio on the rear set. This way they get to remain efficient. Low ‘gear’ when starting out and tooling around and high ‘gear’ out on road. Two motors pulling energy at a time, more efficient than all four! I wanted to see, as Elon promised, the Tesla Semi pull a Peterbuilt backwards up hill!